Digital Mast provides website design and search engine optimisation to businesses across the UK. This case study shows a recently completed project. Website design and search engine optimisation for a top-quality home extension builder in Hertfordshire. 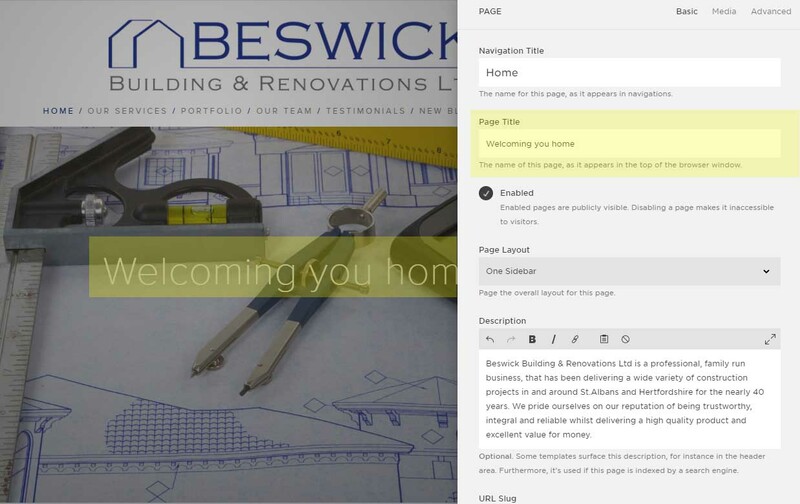 Like many websites we see, Beswick’s website looked attractive enough but wasn’t in anyway optimised to rank in Google. Poor meta titles, little in the way of headings and a site structure that did nothing to show what it is they do. 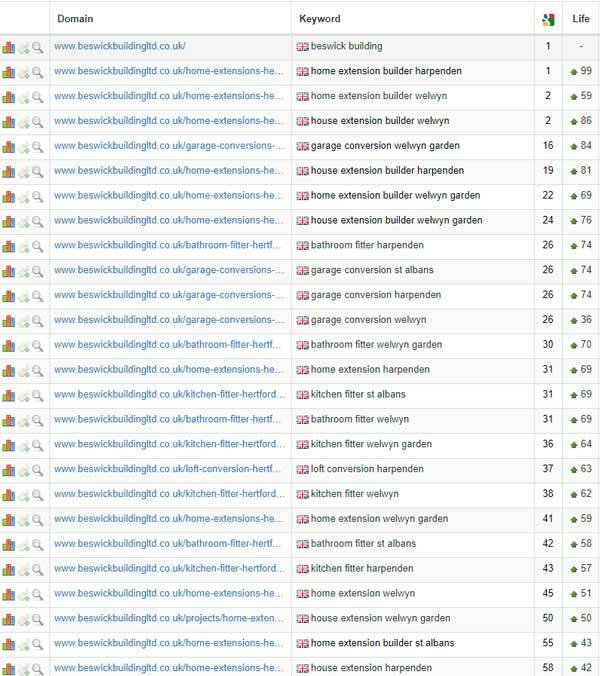 At first, we looked to see if the existing website could be optimised for search engines, to avoid the need to re-build from scratch. It very quickly became apparent that this website, which was built in Squarespace, wouldn’t give us the flexibility and control we need to perform. Squarespace is a great platform for designers and business owners to create websites but it is hugely restrictive in respect to SEO. Typically each Squarespace template has it’s own SEO settings and the control you have differs hugely from template to template. An example is the meta title. Meta titles are the single most important element on a web page for telling Google what the page is about. It’s what appears in search results as the blue text (purple if previously clicked) and at the top of each page in the browser. Every page should have its own meta title and you’ve got around 55 characters, including spaces, to insert keywords and also accurately describe the page to potential visitors. Many of the Sqaurespace templates seem to have been created with no SEO in mind, the “Page title” field, highlighted below is the where the 55 character meta title should be inserted. Unfortunately though the creator of the template has misunderstood it’s use and it also links to the text that overlays the header image! Neither is ideal, I know we don’t want “Digital Mast | Web Design – SEO – PPC – Social media” in our header image and equally we don’t want some weak intro text that doesn’t help us in SEO. Anyway, this is the problem with template based websites, even if the creators of the platform, Squarespace in this case, understand SEO, there’s no guarantee that their template designers will do. Due to the issues mentioned above, amongst many others, the website wasn’t ranking well in google for terms relating to the businesses key services. Aside from “Beswick building” there was nothing in the top 30 for anything relating to their business. So, this is the good bit, where we rip everything apart and build something new. 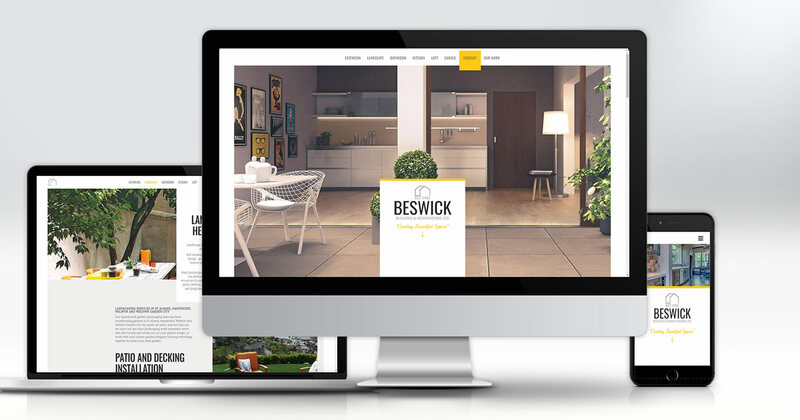 Beswick tasked us with designing the website, writing the copy, sourcing images and performing SEO – we like it when we’ve got a broad scope! Matt wanted a modern site which showcased their abilities in home extensions, kitchen fitting, bath room fitting and landscaping. It needed to appeal to the higher end of the market and be inspiring to home owners. We wanted to give Beswick something impressive and a site that encouraged people to get in touch. What we came up with we hope you’ll agree is a bold design that uses high quality images to show the capabilities their teams have. Everything we do is geared towards performance and whilst a good-looking site is desirable it’s not actually the most important thing to us. What’s more important is its performance in google and how much traffic and ultimately enquiries it generates. We’re happy to report that after only a very short period of time we’ve seen huge gains in Google. Usually SEO takes some months for the full benefits to become apparent, so we’re over the moon that we’re already seeing such improvements after a few days.